Amazon has agreed to acquire PillPack, an online pharmacy, deepening its push into the healthcare space after months of speculation and years of internal debate about whether to add pharmaceuticals to its online empire. The ecommerce colossus will pay $1 billion in cash, per The Wall Street Journal. The synergies between the companies are obvious. PillPack delivers medications in pre-sorted dose packaging to every US state except Hawaii, coordinating refills and renewals and ensuring shipments are delivered on time. The purchase will allow Amazon to ship prescriptions overnight as it takes direct aim at the $400 billion pharmacy industry. Recent months have been full of news involving Amazon and healthcare. Reports emerged last year that talks about expanding into drugs were heating up at the company. In April, it shelved a plan to sell drugs to hospitals through its Amazon Business marketplace but left the door open to conduct such deals through other Amazon branches. And then of course there's the company's new healthcare joint venture being launched alongside JPMorgan Chase and Berkshire Hathaway, a move aimed at lowering the cost of healthcare coverage for workers by cutting middlemen out of a convoluted supply chain that includes pharmacies, drug wholesalers, insurance companies, drug companies and pharmacy benefit managers. Earlier this month, the trio named New Yorker staff writer Atul Gawande CEO of the venture, effective July 9. PillPack should fit into that arrangement comfortably while increasing Amazon's reach far beyond ecommerce. Although details of the takeover are still scant, the news was enough to send pharmaceutical stocks plummeting on Thursday, with Rite Aid (NYSE: RAD) plunging over 10%, Walgreens Boots Alliance (NASDAQ: WBA) shedding nearly 10% of its value and CVS Health (NYSE: CVS) dropping some 6%. These losses cut deeper into market caps that were already diminished by investor anticipation that Amazon might soon push deeper into "their" territory. Express Scripts (NASDAQ: ESRX) fared better than its rivals, giving up only 1.4% of its value. The company's massive plan for a vertical merger with health insurance provider Cigna appeared to shield it from the rout. 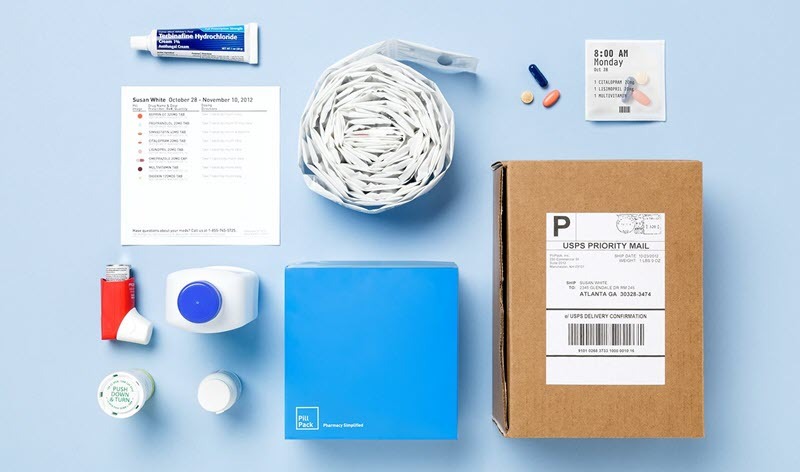 Founded just five years ago by TJ Parker and Elliott Cohen, PillPack has raised $118 million in prior funding across three rounds of VC. In 2014, Accel led an $8.75 million financing for the startup with participation from Atlas Venture. Then, just a year later, PillPack secured $50 million at a valuation of some $288 million in a round led by CRV, with participation from Accel and Atlas as well as Menlo Ventures and Sherpa Ventures. About 15 months later, PillPack was valued at $361 million as part of a 2016 funding that looped in the likes of Accomplice. Amazon has completed 50 transactions since the start of 2007, per the PitchBook Platform, but just one this year—the $1.2 billion purchase of Ring that wrapped in April. The company's largest M&A transaction over the past dozen years remains its pickup of Whole Foods last year for more than $13 billion. The deal for PillPack echoes Amazon's purchase of a 40% stake in Drugstore.com back in 1999. No doubt, Amazon CEO Jeff Bezos is betting on a better outcome this time around: Despite an impressive IPO, shares in Drugstore.com tanked during the dot-com bust and never recovered, despite a cross-selling agreement with Amazon in 2009. Walgreens bought the company in 2011 for $429 million before shutting it down in 2016. Shares of Amazon (NASDAQ: AMZN) added more than 2% on Thursday to give it a market cap of some $841 billion.